This is Part 2 of my review of Emirates A380 First Class on a recent flight from Dubai to London. Part 1, which focuses on the Emirates A380 First Class cabin, seat and bathroom, can be found here. My review of the Emirates A380 First Class lounge in Dubai is here. The official Emirates A380 First Class website is here. As I mentioned in Part 1, Dom Perignon 2006 is the current house champagne of A380 First Class. This is a step up, in price (£110 per bottle) if not necessarily taste, from the Billecart-Salmon served by Etihad. Emirates also puts substantially more money into its First Class wine. The Etihad First Class wines were selling for around £15 per bottle in UK supermarkets. A typical Emirates First Class wine, such as the Grgich Hills Estate Chardonnay 2013, is nearer £25-£30. Some, such as The Mascot 2009, a Sauvignon Blanc, are nearer the £90 – £100 mark. If you enjoy fine wine, or if you ever wanted to see what £90 gets you in terms of a Cabernet Sauvignon at retail price, then you could pass a very pleasant seven hours in Emirates A380 First Class! 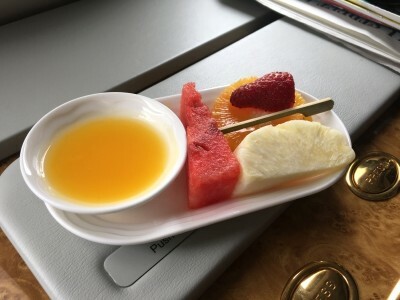 You will notice that I didn’t visit the A380 bar on this flight, which is situated at the back of Business Class and is a bit of a walk from First. 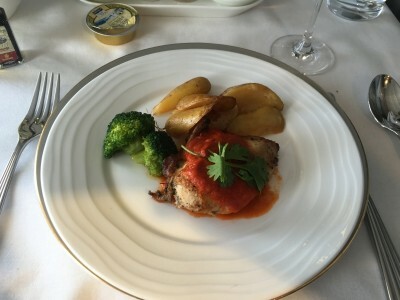 As a day flight from Dubai to London, we were served lunch with the option – which I turned down – of a light snack nearer to landing. I went for the caviar because, well, because I could. And because I rarely find it in the fridge at home. 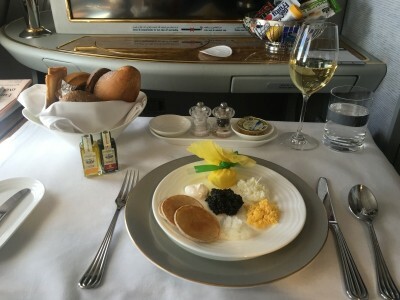 I don’t think that I have ever eaten caviar outside of an aircraft! Side dishes are also available. ….. which was perfectly pleasant and not dry, which is always a risk. It wasn’t life changing but roasted chicken rarely is! Emirates also has an impressive looking cheese selection with six different options. Comparing Emirates and Etihad, Emirates is head and shoulders in the lead in terms of the quality of wine on offer. I would say that the food offering is equal – both were good but not great. 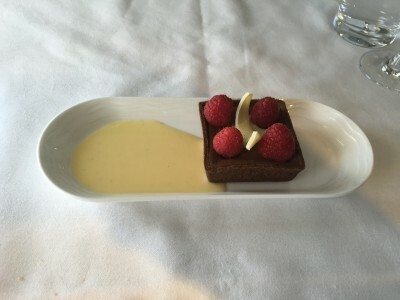 Emirates gets a brownie point if want caviar, Etihad gets a brownie points because of the ‘we’ll make you whatever you want if we’ve got the ingredients’ meal service. All Emirates business and first class passengers get a free chauffeur service within a 70-mile radius of the airport. This also applies to reward tickets. As you emerge airside in Heathrow Terminal 3 there is an Emirates representative to meet you. He will point you to the car waiting area – this is only a few feet away but you can’t actually see it as you enter the airside area. …. to pass the few minutes until your driver is ready. It is then literally a 10 second walk to get outside where you vehicle will be waiting. It is an amazingly quick transfer. I don’t know if I got lucky or if Emirates allocates its best cars to First Class passengers, but this was the smartest car (Mercedes S Class, operated by Tristar) I had out of the four I was given on this trip. It was a very pleasant end to the trip. If you can’t see the video then click here to visit our YouTube channel where you can watch it. You can also subscribe to our channel from that page. I paid for the ticket using 85,000 Emirates Skywards miles, obtained via a 1:1 transfer from American Express Membership Rewards. (Those Amex card referral points come in useful!) The taxes and charges were Dhs 1,535 which is currently £335. This is more expensive than a one-way British Airways First Class redemption to London (68,000 Avios on an off-peak date + £198) but included four chauffeur drives which saved me around £200 – or £80 if I would have taken the tube instead in London. It would be a shame not to try Emirates First Class once if you want a high-end First experience – and a shower. The easiest way to get it using miles would be to get the current sign-up bonus on the Emirates credit cards (25,000 on Elite and 12,000 on the free card – and you can get both), put some spend through on the Elite Amex (2 miles per £1) and top up using Amex Membership Rewards points. Heavy credit card spenders could rack up the necessary miles purely via the Emirates Elite American Express card which earns 2 miles per £1. If you put a lot of business expenses on your credit card then this may be something that is achieveable. The Emirates First Class product still impresses with its drinks selection, the huge TV and massive IFE selection and the semi-private suite seat with the closing doors. The food is marginally less impressive and the seat could do with a bit of an overhaul, but you will still find it more than comfortable. 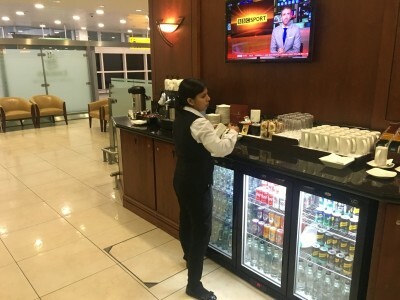 I found the First Class lounge in Dubai to be eerily deserted and in Heathrow you are sharing the Business Class lounge with no private dining – not so great. Which is best? Emirates A380 First Class or Etihad A380 First Class Apartment? The Etihad First Class Apartment wins out purely on the basis of ‘wow’ factor, because you will never get as much private space to yourself on a commercial aircraft. Best IFE? Tie, both are very impressive. The Etihad screen is bigger. In reality, if you’ve never experienced either product then you will be impressed. You can find out more about Emirates A380 First Class on this special page of the Emirates website. How many points was the Ethiad first class one way? Use the search box for the review Rob did. It was mentioned on there. Talking of wines, don’t forget to mention for the brandy lovers that EK F carries a very nice cognac, Hennessy Paradis, which retails at around £600 per bottle in the UK. Still no guarantee of an A380 with Etihad, whilst they are supposed to operate 3 flights a day to Abu Dhabi I notice that tomorrows EY17 is an A340-642. I got caught out by this on a flight from Australia, the first leg was in F on Emirates to Dubai, and the second leg was supposed to be F on an Etihad A380 to London, they changed it a few days before to a 777, and refused to move me to another flight. I am looking to book something similar at the moment but might go bling all the way (partly funded by the 120,000 MR i got today from those kind people at amex for a sign up bonus). 120,000 MR sign up bonus, please inform us (me) of which bonus this is? ahhh you got my hopes up Hingeless for a massive bonus. Nevermind! I’ve just had a quick look at the Amex Australian cards they offer some huge sign-up bonuses but look like you only get it once? You also have a high earning rate on some cards 3 MR to the $. Impressive. Is it always a “he”? O/T – First world problem alert. When flying with kids aged 9 and 6 (on BA), is it actually easier to go J rather than F on a 777? My kids are well behaved and seasoned travellers, but have never been in F before with them. I’m not sure if the seating layout in F would mean they feel a bit alone? Thoughts welcome. Apologies again for the first world problem. I did this EXACT thing on Sunday (with a 9 and a ‘5 and 50-weeks’ year old). F was fine. The kids sat in the middle pair and my wife and I had the windows (all of row 2 on a 777). Kids watched TV or iPad for 12 hours and did not disturb anyone. What I learnt in October is do NOT put a 5-year old in an F window seat because, when they want something, they should out because they can’t see you in their line of sight. This annoys other passengers, especially if the kid is wearing headphones and feels the need to shout at full volume! In the middle pair the siblings can talk to one another if they need anything. I booked a couple of first class tickets on Emirates through Alaska Airlines partner program. I started in Singapore, a stay over in Dubai, and then ended up at JFK. I attempted to book the chauffeur service online on Emirates airline, but was unable on several attempts. I then called Emirates direct to book it. On 3 separate occasions I was told that the service is not available on award travel from partner airlines. Anyone else ever been told this? I do not understand why on this site price and quality of wine seem to go hand in hand when comparing airlines. Any sommelier will tell you that taste has nothing to do with price aloneJudging an airline by the cost of a bottle of wine in the UK market is not a valid point of judging at all in my opinion. You just talk money, why not talk taste and pairing qualities! The taste and nose are what matters whilst enjoying wine! ….. because I don’t consider that my strong point. Well after all these year slamming it in F and J I expect more of you Rob! Lol btw this was a remark rather than anything else. I always ask the FA to serve me the wine she/ he recommends with the dish I ordered. That way the taste and not the name on the bottle does the talking! … but not when being a pompous show-off git (see ‘because I could’ comment re.caviar above). What a snob. Just try flying that Australian airline from Australia to LAX and it puts to shame your flight!! I flew Premium Economy once, It was pretty plush!